R. Emmet Doherty was a pioneering crusader for clean air issues in the Lehigh Valley area of Lehigh and Northampton counties in the 1960s and the mid 1970s. He served as director of the Lehigh Valley Air Pollution Control District for 19 years, retiring in 1975. Doherty monitored air pollution levels in the Lehigh Valley and assisted area industries (especially cement companies) install pollution controls to alleviate the cement dust problems prevalent in the area. Doherty was also a tireless promoter of clean air concepts to students, families and industries throughout the Lehigh Valley. Please describe the nominee's history of clean air advocacy or achievements/ projects where their work was instrumental in promoting widespread air quality education, activism, or real reductions in ground-level ozone and particulate matter in our region. Kevin Stewart of the American Lung Association speaks during the presentation of the R. Emmet Doherty Clean Air Award. 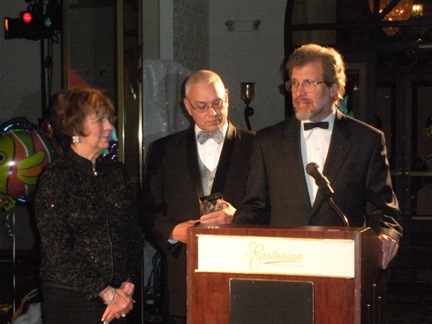 Recipient Steve Schmitt, center, and Shirley Lentz of the Woman's Club of Allentown, a co-sponsor of the award, left, listen as Kevin praises Steve's body of work.